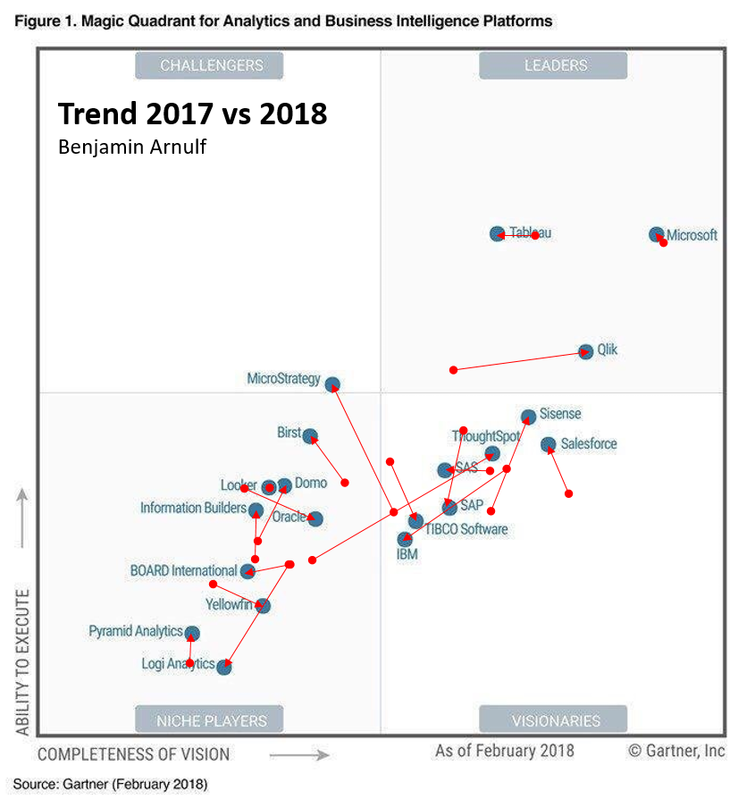 Gartner Magic Quadrant for Analytics and Business Intelligence Platforms 2018: What's New?! Yesterday, Gartner published the 2018 Magic Quadrant for Business Intelligence. The MQ research for BI has been in existence for close to a decade. It is THE document of reference for buyers of Business Intelligence technology. 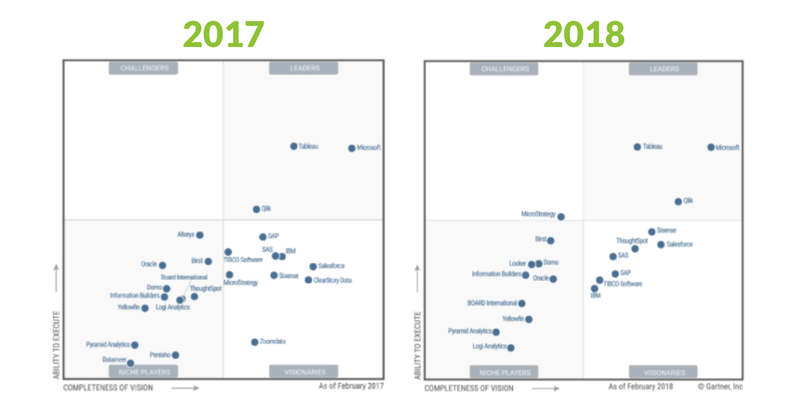 For the first time in 3 years, Gartner dropped a significant amount of vendors off its quadrant. There were 24 vendors in the firm's quadrant in 2016 and 2017. This year, the Magic Quadrant only lists 20 vendors...that's a 16% quadrant reduction. Has the market shrunk?! New in 2018: *MicroStrategy* (NASDAQ: MSTR) is a Challenger. Huh?! The Challenger box was empty in 2016 and 2017. What has changed this year? Is this because MicroStrategy announced that they were opening their semantic layer to the rest of the BI tools? Is Gartner seeing this move as a force that could potentially challenge the industry in a new direction?! By 2020, the number of users of modern business intelligence and analytics platforms that are differentiated by augmented data discovery capabilities will grow at twice the rate — and deliver twice the business value — of those that are not. By 2020, organizations that offer users access to a curated catalog of internal and external data will derive twice as much business value from analytics investments as those that do not. We believe Gartner is on to an important theme here: Business Intelligence is about Business Value. "Self-service BI", the trend that drove the industry’s 60% YOY growth in 2015 created some unintended consequences: enterprises bought a lot of BI tools. Some brought value. Some did not. The consequence: in 2017, the market grew by only an estimated 10% and Gartner now expects it to grow at 8% through 2021. This doesn't mean the opportunity for "data democratization" is shrinking: the industry's adoption numbers are still in the low 30%. It means however that growth is slowing down: in the report, Gartner refers to "saturation" and "pricing pressure". We believe that the industry is hitting a saturation point with its current approach. And we know this because, in a market that's slowing down, players are forced to compete on cost in order to grow. When business value can't be proven, cost-savings conversations take the lead. We need to get back to value! This Magic Quadrant was supposed to be published on Feb 16 according to Gartner's site. We can only guess that the reason why it took a few extra weeks is because of some of the radical new changes that occurred in this year's edition. Self-service BI has shaken the industry and has resulted in several unintended consequences. Business units have bought all the tools they could buy, and now I.T departments have to bring order to their BI chaos. Modern Business Intelligence approaches include a "Universal Semantic Layer". Data Lakes have become ubiquitous. The average Chief Information Officer spends close to $20M a year to orchestrate Big Data analytics workloads across traditional data warehouses like Teradata, modern data platforms like Hadoop and next-generation serverless technologies like Google BigQuery. As a result, the data platform ecosystem has become more complex, not less. The Cloud, as highlighted in our last Big Data Maturity survey, will drive 72% of enterprise CIOs to modernize their enterprise data architecture and economically scale their deployments. This will bring great benefits to the enterprise but it will also result in a mixed on-premise and cloud environment which will create more headache for IT and business users alike. 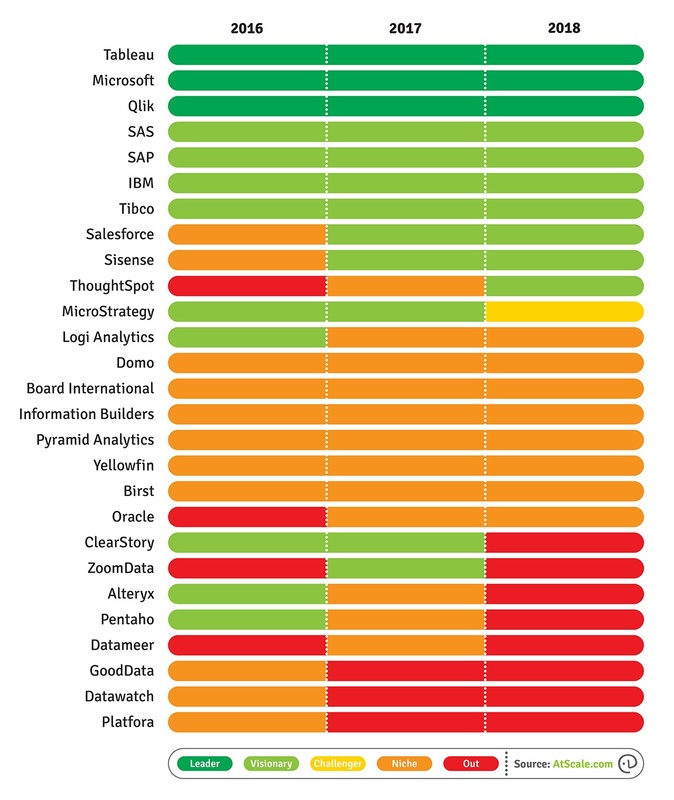 The AtScale "3-year-MQ-movement analysis table"
In case the 3-year movement table above is too much, we recommend Ben Arnulf's year-over-year analysis. Now, as we explained in our MQ analysis webinar (recording available here), remember that criteria change over time. Movement is a factor of many things: vendor capabilities but also Gartner's methodology for each year. == Reference: Gartner, Inc., “Magic Quadrant for Analytics and Business Intelligence Platforms,” by Cindi Howson, Rita L. Sallam, James Laurence Richardson, Joao Tapadinhas, Carlie J. Idoine, Alys Woodward, February 26, 2018.